The Wyrrabalong National Park is a protected national park that is located on the Central Coast of New South Wales, in eastern Australia. The 620-hectare (1,500-acre) national park consists of two main sections; the northern section consists of approximately 480 hectares (1,200 acres) and covers a substantial area of the peninsula between The Entrance and Norah Head as well as Terilbah and Pelican Islands within Tuggerah Lake. The southern section consists of about 120 hectares (300 acres) of the coast, from Shelly Beach south to Forresters Beach. The park is also noted for containing the last significant coastal (littoral) rainforest on the Central Coast. Most of the park lies in the Tuggerah Important Bird Area, identified as such by BirdLife International because of its importance for a variety of water and woodland birds. 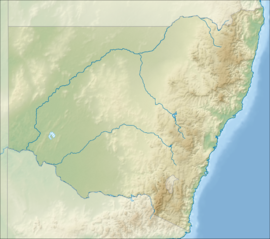 The land now occupied by Wyrrabalong National Park was first inhabited by the indigenous Darkinjung and Awabakal peoples. The Darkinjung occupied the southern section and The Awabakal occupied the northern section. It is believed Europeans first discovered the Tuggerah Lakes in 1796. It was found by Governor of Tasmania, Colonel David Collins, who had arrived on the First Fleet, during the search for an escaped convict, Mary Morgan, who was said to be living with the Aborigines to the North of the Hawkesbury River. ^ a b "Wyrrabalong National Park: Park management". Office of Environment and Heritage. Government of New South Wales. Retrieved 4 October 2014. ^ "Wyrrabalong National Park: Plan of Management" (PDF). NSW National Parks and Wildlife Service. Government of New South Wales. 25 March 2013. ISBN 978-1-74359-198-7. Retrieved 7 February 2007. ^ "Wyrrabalong National Park". Geographical Names Register (GNR) of NSW. Geographical Names Board of New South Wales. Retrieved 11 August 2013. ^ "Tuggerah". Important Bird Areas factsheet. BirdLife International. 2011. Archived from the original on 10 July 2007. Retrieved 17 November 2011. ^ "Who Found Tuggerah Lake?". theentrancetcm.com.au. Retrieved 18 July 2006. "Wyrrabalong National Park: Visitor guide". NSW National Parks and Wildlife Service (PDF brochure). Government of New South Wales. 2012. This New South Wales protected areas related article is a stub. You can help Wikipedia by expanding it. This page was last edited on 19 April 2018, at 04:04 (UTC).